We are engaged in manufacturing, supplying and exporting a wide assortment of PET Box strap machine to our reputed clients. 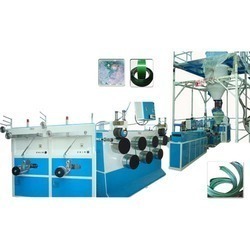 Our offered extrusion line is mainly used in package areas, used to produce polyester strap, etc. This extrusion line is manufactured using high quality components and advanced technology and is checked at different stage of manufacturing under the supervision of professionals experts.